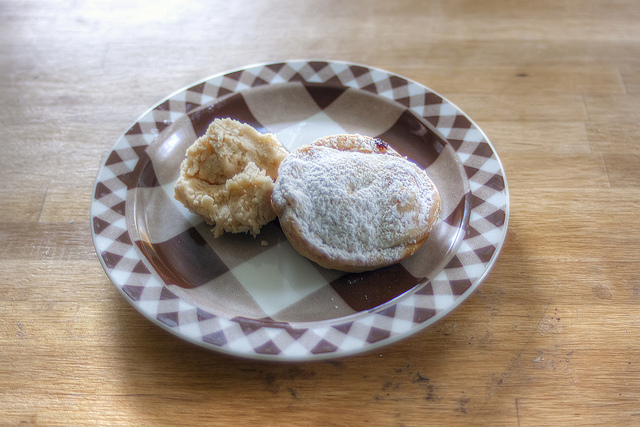 Mince pies pictured without their ubiquitous companion, rum butter. Did you guys know that my husband Andy is English? 1. The accent, of course! 2. His comebacks are INSTANTANEOUS. It’s amazing, and I love how my mom still cracks up when he says something particularly witty. 3. Family in Europe! I promise, eventually I’m writing a post about my trip to England in 2009. 4. Vocabulary. We’ve known each other for nearly seven years, and still he comes out with English words and phrases that are completely new to me. First I’ll tell you about mince pies (recipe sourced from here), since I’m craving them right now (why are the holidays over??). Mince, or mincemeat, pies are filled pastries traditionally served in the UK around Christmas. 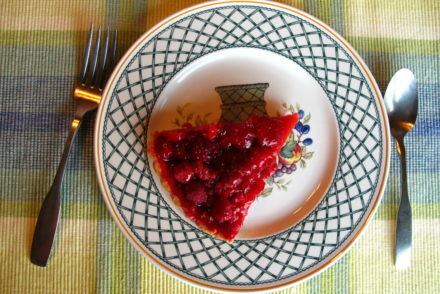 When most people hear ‘mince pies’, they think ‘mincemeat’. Yes, traditional mincemeat includes beef of some sort (as evidenced in this BBC recipe), but fortunately we found a meatless version in the supermarket. For those unaware, it’s full of yummy things like raisins, spices, orange peel, and apples, and as it’s brown and lumpy, doesn’t look all that attractive on its own. HOWEVER. Then you top that filling with a cute little pastry cover, bake, and sprinkle with powdered sugar. Ta da! Pretty mince pies! The crucial part is the rum butter (sometimes brandy butter) that goes on top of the pie: rum, butter, and sugar, blended together. When Andy asked his mum for some precise instructions on mixing said butter, she said she had never actually measured the rum part. Ha! The mince pie is really a vehicle for the rum butter, Andy and I found ourselves saying several times over the holidays. I promise, it’s scrumptious. We called these Cutie Pies because Andy made them with leftover dough and so they came out miniature! Andy actually made mince pies and rum butter for four separate occasions in December, pastry from scratch and all. 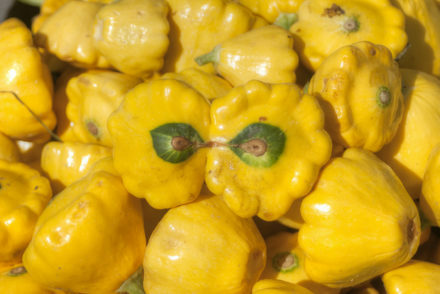 Many friends and relatives had never eaten them before, so it was fun watching their reactions. Some people declined, some people raved, some people thought they were odd, and my dad likes the pies, but without the rum butter (what!?). This is cute and all, but you cannot have just one. Oh man. 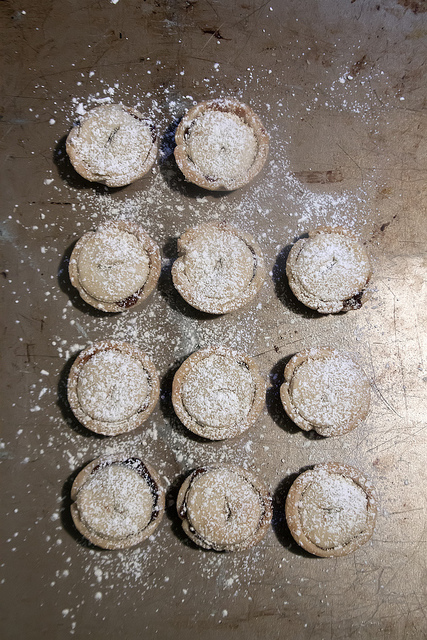 After looking at these pictures so much, I hope I can convince Andy to make a post-holiday batch of mince pies! 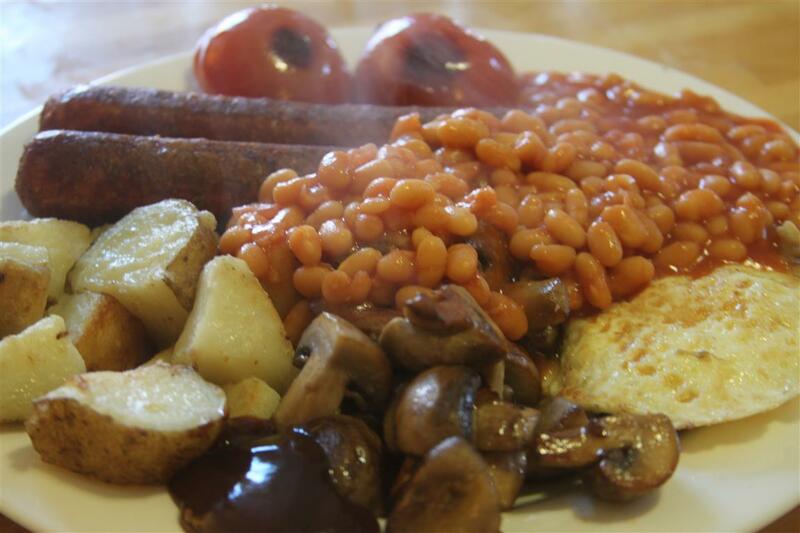 Next, we have the completely unrelated but still quite English dish, a full breakfast. On the plate: fried eggs, fried tomatoes, fried mushrooms, fried potatoes, baked beans, and (fake) sausage. Missing is the toast and black pudding (I am so happy to be vegetarian!). Also missing on my plate is the mushrooms, because they are the one food I cannot stand in any form. Everything else I’m cool with. The Englishman’s plate is on the right. Andy can never have too many baked beans. Two essentials in this meal: Heinz baked beans and HP sauce. According to Andy, Heinz is the The One and Only brand of beans, and HP sauce, AKA brown sauce, is an English condiment that reminds you of ketchup, but also of Worcestershire sauce. I found both items on Christmas Eve with my mom, overjoyed to discover that her local supermarket had a little British section. Yay! 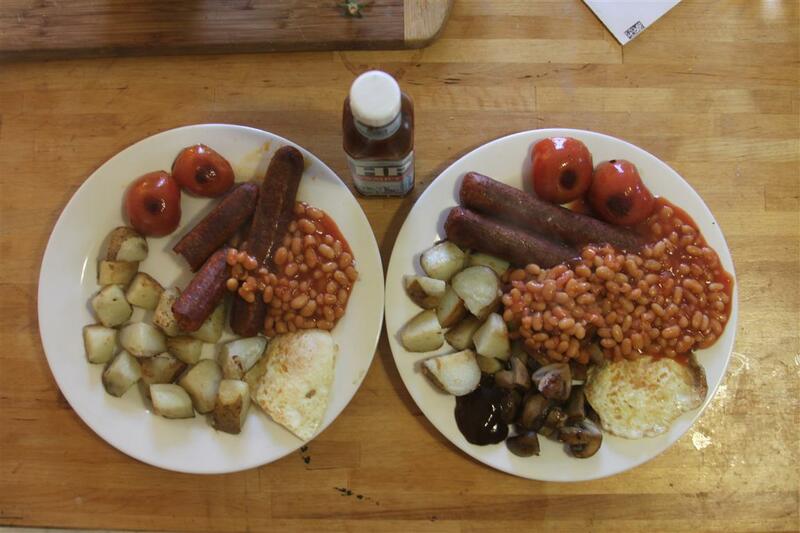 That stuff on the very bottom is HP sauce, the beloved British condiment. For a quick snack, one can also go with the English dish of beans on toast. Baked beans strike again! Looking for something else to add to any meal? Throw on some baked beans! I still find this one a bit odd sometimes, but that’s due to Andy’s and my differences in toast preferences: I prefer well toasted bread, especially if something saucy is going on top. Andy’s more of a soft toaster. But oh man, does he love beans on toast. Put some cheese on top and he’s in heaven. 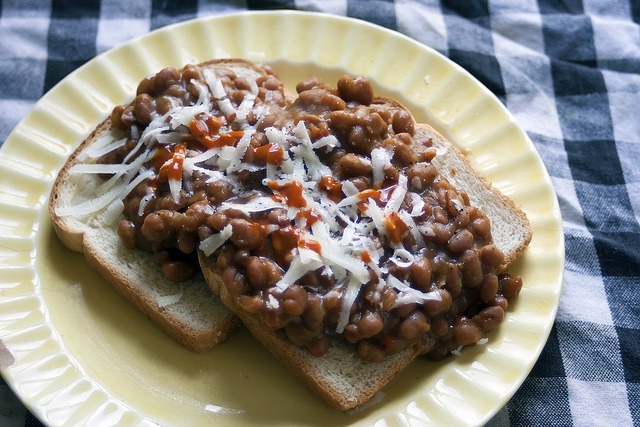 Baked beans on toast with cheese sprinkled on top: the way to an Englishman’s heart. I hope that I haven’t made you guys too hungry. Have a good Wednesday and may you all eat something delicious today! 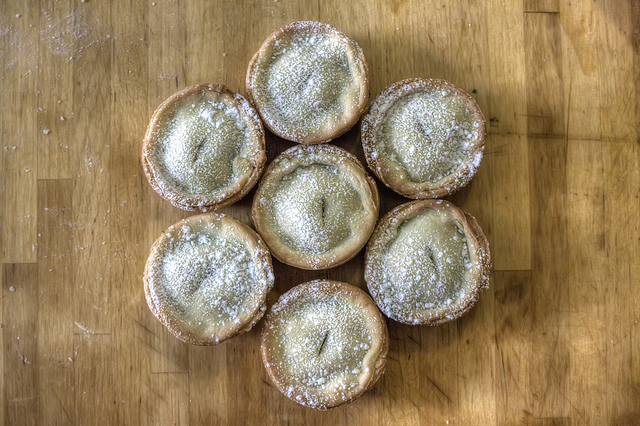 Have you ever had mince pies? What do you think of rum butter? 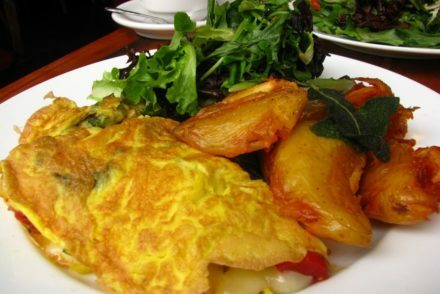 Do you have a staple breakfast item? will clearly see what my favorite breakfast is, lol. (SN): I’m reading a book by a British author and the characters keep saying things like, “That club was pants”…it was in there enough for me to look up British slang. It means crappy, or just plain not good. I’m seriously jonesin’ for some rum butter! And I’ve never heard of pants, haha. At first I looked at your Good Eats board and I was like….there’s no breakfast here. My favorite meal, of course! Have you ever made the smitten kitchen’s recipe? she uses sour cream or yogurt, and shredded apple and they are SO GOOD. Traditional English breakfast is something to behold. I remember when I was studying there, my friend ordered one and I was shocked at the amount of food that went into it! Not that there’s anything wrong with hefty breakfasts! I’d love to see a post about your trip to England – when you have time, of course! I know, isn’t it so much food? All fried too, haha. Now that I know you’re interested, I’ll work on that England post! I didn’t know he was English but now I’ll look at the photos of him differently and picture an accent! You should go into business making “Cutie Pies.” I’d buy two dozen. And baked beans on toast with cheese is going to be my dinner tonight! My husband will eat most things but he will not touch mushrooms. That’s how I feel about onions, which is more unfortunate, because they’re in everything. 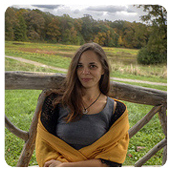 Tamara recently posted…Something So Simple. Actually, I feel mostly the way you do about onions- never raw for me, and always very well cooked. Thanks for your comment! I have not had mince pies before, but I would try one! I haven’t tried rum better either. Mmmm, that plate looks tasty though! I do love my beans. This has been an educational post. I didn’t realize mince pies had sweet ingredients. And were topped off with powdered sugar. I cannot even imagine beans on toast. I do love sauteed spinach and poached eggs on toast (totally different, I know), and I’m a big bean fan, so I’d be open to it! Shana Norris recently posted…Best Monster Cookies Ever. You made me laugh! Certainly didn’t expect anyone to say they were envious, haha. Glad I could educate you about mince pies- and beans on toast! I’d never had either one before I met Andy. I know English breakfasts are a little overwhelming but I totally love them! I mean, how can you go wrong with all that awesome fried food 🙂 I’ve never had mince pies before but they sound tempting! Exactly, I feel that way about fried food, too! 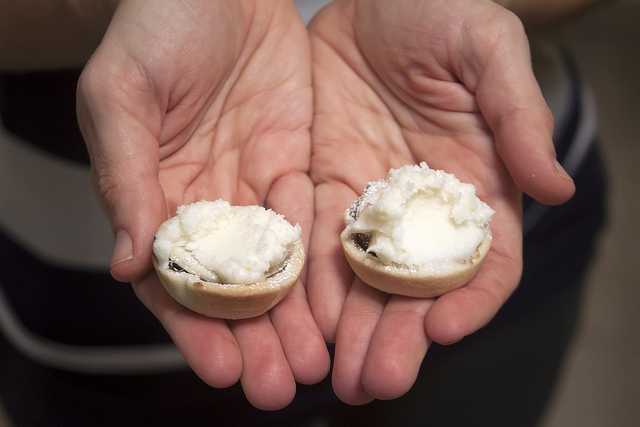 And mince pies weren’t tempting to me the first time I had them, but I have grown to love them! I’ve had mince pies – in England. I went on two Student Exchanges when I was in High School (near London) and I’ve been to London several times. Yay for mince pies! I’ve only been up to the Nottingham/Leicester area in England, since that’s where my in-laws are. Still can’t believe I haven’t seen London yet! I visited England for the first time this summer, and I absolutely loved it. I’ve made mince meat pie before but never with the rum butter – what a delicious addition! And the English breakfasts we had were warm and kept us nice and full! It’s the most delicious addition I’ve ever heard of! And yup, no question that English breakfasts keep you full, haha. What part of England did you visit? Thanks for your comment, Catherine! I stayed in London, but the best day by far was our train ride to Oxford. If I go back, I want to see the countryside. There was just too much to see in only five days!